Card catalogues were once vital components of libraries; most were beautifully crafted of durable materials. Now some enterprising librarians are finding ways to repurpose card catalogues as storage sites and charging stations for e-book readers. 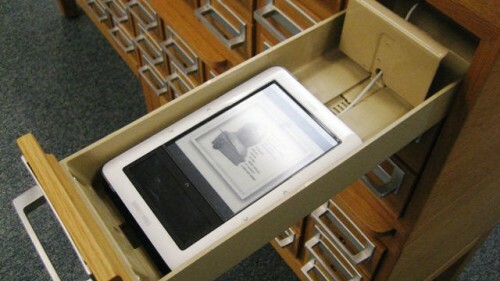 It turns out that the drawers were just the right size for most of the common eReaders. All the case needed was a few holes drilled in the back, and then running some power cables.